Someone basically said that 1=1 is generally lazy and bad for performance. Given that I don't want to "prematurely optimize" - I do want to follow good practices. I've looked at the query plans before, but generally only to find out what indexes I can add (or adjust) to make my queries run faster. The question then really... does Where 1=1 cause bad things to happen? And if so, how can I tell? Minor Edit: I've always 'assumed' as well that 1=1 would be optimized out, or at worst be negligible. Never hurts to question a mantra, like "Goto's are Evil" or "Premature Optimization..." or other assumed facts. Wasn't sure if 1=1 AND would realistically affect query plans or not. What about in subqueries? CTE's? Procedures? I'm not one to optimize, unless needed... but if I'm doing something that is actually "bad", I'd like to minimize the effects or change where applicable. The SQL Server parser optimizer has a feature called "Constant Folding" that eliminates tautological expressions from the query. If you look at the execution plan, nowhere in the predicates you will see that expression appear. This implies that constant folding is performed anyway at compile time for this and other reasons and it has no effect on query performance. See Constant Folding and Expression Evaluation During Cardinality Estimation for more info. The addition of the redundant predicate can make a difference in SQL Server. In the execution plans below notice the @1 in the first plan vs the literal 'foo' in the second plan. 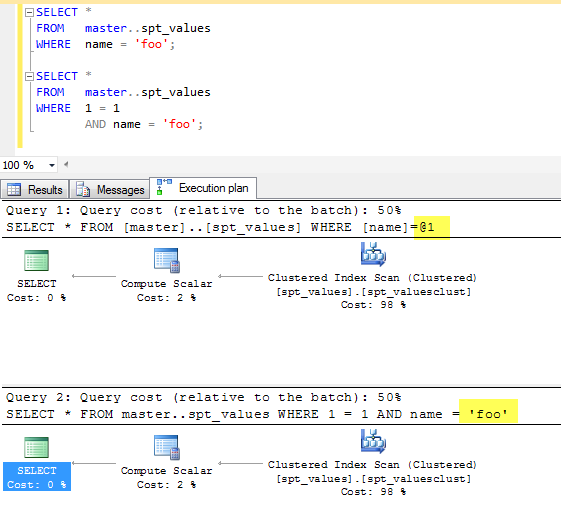 This indicates that SQL Server considered the first query for simple parameterisation to promote execution plan reuse - however the comparison of two constants prevents this from happening in the second case. simple parameterisation isn't generally something that you should be relying on anyway though. It is far better to explicitly parameterise your queries. In any modern RDBMS (including Oracle, Microsoft SQL Server and PostgreSQL - I'm sure about these) this will have no effect on performance. SELECT 1 FROM empty_table; -- run this 10 000 times. SELECT 1 FROM empty_table WHERE 1=1; -- run this 10 000 times and compare. This can be "problem" for Oracle when you use database parameter cursor_sharing. When this is set to "force" it will modify all SQL statements. All the "constants" in queries will be replaced by bind variables(like 1 => :SYS_0). This option was introduced to deal with some lazy developers. On the other hand it can also harm other lazy developers. But the risk is not too high. Since 11g it has bind variable peeking feature. Not the answer you're looking for? Browse other questions tagged performance optimization or ask your own question. Is it possible to give the optimizer more or all time it needs? Disk usage spikes: good, bad or indifferent? Is this the right attitude from the DBA team?